I’m sick of blogging about the self-important, pompous, and utterly provincial British REF (“Research Excellence Framework’). Enough miserablism (André Breton), at least for today. 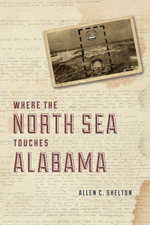 Instead, I would like to celebrate the October publication by Chicago University Press of Allen C. Shelton’s Where the North Sea Touches Alabama, the follow-up to his widely praised Dreamworlds of Alabama (Minnesota UP, 2007). I have known Allen since he first invited me, over ten years ago now, to participate in the remarkable festival of arts and ideas he organized annually on a shoestring budget in Buffalo, NY under the Benjaminian title Ethnographic Dreamworlds. Some of the richness of those meetings, which brought together intellectuals across disciplines, performers, and visual artists, can be gleaned from the soft arcades website that survives as a ghostly record of an extraordinarily vibrant event. It was through Allen and Ethnographic Dreamworlds that I met, among others, Kathleen Stewart, Patricia Clough, Danielle Egan, and Susan Lepselter—scholars doing courageous and pioneering work that make the standard disciplinary boundaries in the humanities and social sciences seem no more than quaint and rather incomprehensible antiques. Allen was kind enough to visit Lancaster University last year as a participant in a cross-disciplinary writing workshop for PhD students, on whom he left a lasting impression. Next Post: Lancaster’s REF: Stockholm syndrome or worse?